Murania Press » Speaking of Serials…. If you’re a film buff who spends a fair amount of time watching the Turner Classic Movies channel, you’re probably familiar with Flicker Alley. Originally a small boutique DVD label that offered rare and obscure silent films to hard-core collectors, they have broadened their activities to include full-scale restorations and marketing of archival gems sourced from around the world. Many of their efforts appear on TCM. Their latest project is an English-titled release of La Maison du Mystère (The House of Mystery), a 1923 French silent serial directed by Alexandre Volkoff and starring the distinguished Russian actor Ivan Mosjoukine. Like many chapter plays produced in France during the silent era, Maison du Mystère eschewed the American model of fast action and daredevil stuntwork, preferring instead to tell its melodramatic story — which unfolds over an 18-year period— at a more leisurely pace. It’s a remarkable film, perhaps not blood-n-thundery enough for some tastes but extremely fascinating in its own right. Flicker Alley asked me to be their most recent guest blogger and I’ve just filed a piece on silent serials,which you can read here under the title “Careers, Cliffhangers, and Commerce: The Serial’s Place in Film History.” I’m looking forward to their upcoming DVD release of Mystère, which will be previewed later this year at the Mid-Atlantic Nostalgia Convention. 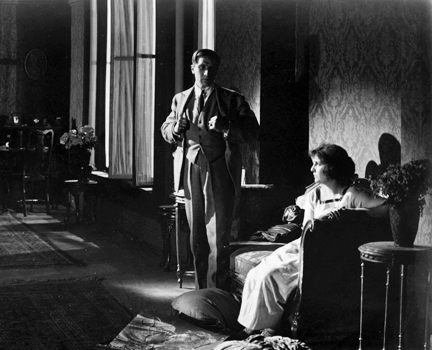 Ivan Mosjoukine and Helene Darly in LA MAISON DU MYSTERE.